$8 Off all Custom Binders! Save on custom design binders, just in time for back to school. Enter code: STYLEBINDER8 and get $8 off all binders. Get a special binder for school subjects and a scrapbook binder for the school year memories. Do the kids have a favorite superhero or cartoon characters? Let these Batman binders, Barbie binders or Looney Tunes binders make school a little more fun. Savvy brides and planners should jump on this chance and save on wedding planning binders. Hurry, sales ends Aug 09, 2011. See more binder styles here. * $8.00 of the binder net sale price will be deducted when one or more qualifying binders are purchased and the coupon code STYLEBINDER8 is applied at checkout. The net sale price is the price of the product (excluding shipping and taxes). Offer is valid through August 9, 2011 at 11:59pm PT. This promotional offer may not be combined with any other Zazzle promotional or volume discount offers. If a volume discount applies to your order, you will receive either the discount set forth in this offer or the standard volume discount, whichever is greater. Offer valid on Zazzle.com only. Up to 75% off Black Friday deals! * 50% of the mug net sale price will be deducted when one or more qualifying mugs are purchased.Â The coupon code BLITZDEAL144 must be entered during checkout to receive the offer. The net sale price is the price of the product (excluding shipping and taxes). Offer is valid through November 26, 2010 at 2:00 AM PT. This offer does not apply to past purchases and may not be combined with any other Zazzle promotional or volume discount offers. If a volume discount applies to your order, you will receive either the discount set forth in this offer or the standard volume discount, whichever is greater. Offer valid on Zazzle.com only. * $10 of the binder net sale price will be deducted when one or more qualifying binders are purchased.Â The coupon code BLITZDEAL184 must be entered during checkout to receive the offer. The net sale price is the price of the product (excluding shipping and taxes). Offer is valid through November 26, 2010 at 4:00 AM PT. This offer does not apply to past purchases and may not be combined with any other Zazzle promotional or volume discount offers. If a volume discount applies to your order, you will receive either the discount set forth in this offer or the standard volume discount, whichever is greater. Offer valid on Zazzle.com only. * 75% of the apparel net sale price will be deducted when one or more qualifying apparel items are purchased from http://www.zazzle.com/harrypotter.Â The coupon code BLITZDEAL119 must be entered during checkout to receive the offer. The net sale price is the price of the product (excluding shipping and taxes). Offer is valid through November 26, 2010 at 6:00 AM PT. This offer does not apply to past purchases and may not be combined with any other Zazzle promotional or volume discount offers. If a volume discount applies to your order, you will receive either the discount set forth in this offer or the standard volume discount, whichever is greater. Offer valid on Zazzle.com only. * 70% of the invite and/or card net sale price will be deducted when one or more qualifying invites and/or cards are purchased.Â The coupon code BLITZDEAL191 must be entered during checkout to receive the offer. The net sale price is the price of the product (excluding shipping and taxes). Offer is valid through November 26, 2010 at 8:00 AM PT. This offer does not apply to past purchases and may not be combined with any other Zazzle promotional or volume discount offers. If a volume discount applies to your order, you will receive either the discount set forth in this offer or the standard volume discount, whichever is greater. Offer valid on Zazzle.com only. Get $9.00 off all custom binders! We've all seen professionals using custom made binders for business presentations, portfolios and training manuals. Now making those type of binders is a snap for everyone. Get creative and make custom binders for family photos or create a wedding planner for the bride-to-be. 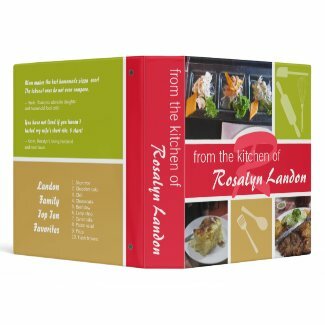 Honor your home chef with a recipe binder, or reward kids with an art work binder or music sheet binder. Create your custom binder on-line is simple. Just type in your own text, upload your own photo or logo. You may also customize any existing designs. To see how easy it is, click on my recipe binder design above and give it a go. Get started and save $9.00! simply enter AVERYCUSTOM1 during checkout. This offer expires Dec 31st 2010. * $9.00 of the binder net sale price will be deducted when one or more binder items is purchased and the coupon code AVERYCUSTOM1 is applied at checkout. The net sale price is the price of the product (excluding shipping and taxes). Offer is valid from November 18, 2010 through December 31, 2010 at 11:59pm PT. This offer does not apply to past purchases and may not be combined with any other Zazzle promotional or volume discount offers. If a volume discount applies to your order, you will receive either the discount set forth in this offer or the standard volume discount, whichever is greater. Offer valid on Zazzle.com only.